Location : Bidar (Narasimha Jhara), Karnataka. Narasimha Swami Temple is known to be a sacred temple for a Hindu devotee. This water cave temple virtually runs into a cave with water measuring 300 meters. The temple is a powerful deity of Lord Narasimha as per the belief where one has to wade through water up to chest height to have darshan of the idol. It s a thrilling experience to travel through the cave as there is natural water within it. The bats and owls sitting on the roof top of cave are harmless to the devotees. The place is surrounded by picturesque valley. This is an old Hindu cave temple dedicated to Lord Narasimha. It is excavated in a tunnel, A legend says that Vishnu after Killing Hiranyakashyap, slew another giant named Jharasura. While breathing his last, Jharasura beseeched Vishnu to reside in the cave in which he was living and to grant boons to devotees. Granting last wish of his, Narasimha came to live in the cave. 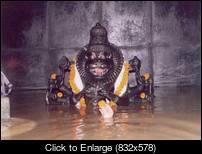 There is a roughly carved image of Narasimha on a stone wall at the end of the cave. For seeing the deity, the visitor has to wade through a canal of 91 meter. The flow of water in the channel is continuous. The depth of the water in the channel is generally 1.37 meters. A good number of devotees visit this temple. Papnash Kshetra is another sacred place of Bidar city. The Shivaling hear is worshiped with much devotion. Locals say that the temple came into existence when Vishnu killed Hiranyakashyap, slew another giant named Jharasura. While breathing his last, Jharasura requested Vishnu to reside in the cave in which he was living and to grant boons to devotees. Granting last wish of his, Narasimha came to live in the cave and hence the name.